These devotions were offered at an SIS faculty meeting in February 2018. For our devotions today, I have chosen Psalm 46. It is the text we chose for our family Christmas letter last year. One of the reasons we chose it was that we had it at our wedding 30 years before. Having heard Psalm 46, you may wonder why we chose for our wedding a psalm that predicts trouble in the form of earthquakes, tsunamis (2), wars, and falling kingdoms (6)! Actually, it was Sebastian who suggested it. He thought that since we were setting up home together, we needed to be reminded of its opening promise that God is our refuge and strength (1). After thirty years of marriage, I understand! This Psalm is known as one of the “Psalms of Zion.” Jerusalem was a sanctuary city for God’s people and for others in need. However, a human city offers limited protection, and as later psalms (such as 74, 79) acknowledge and lament, the city is later destroyed. As we read this psalm, we see that the focus is not on Zion but on God, Israel’s God, Yahweh – the “Most High” god (4), the captain of heaven’s armies (7, 11), and the faithful and merciful God of Jacob (7, 11). Yahweh’s presence, Immanuel – God with us, which is referred to four times (1, 5, 7, 11), is what gives the assurance that, though mountains shake and kingdoms totter, the city will not be moved. Although Sebastian thought this was a good psalm for a wedding, the connotations for me were quite different. Psalm 46 was the inspiration for Martin Luther’s great hymn of defiance during the Reformation, “Ein feste Burg ist unser Gott” – “A mighty fortress is our God.” But in Britain the Psalm is better known because it is used on Remembrance Day, November 11th, and there is a famous setting to tune of the Dambusters’ March. On Remembrance Day, which is referred to here as Veterans’ Day, we remember the fallen of two World Wars and many other wars, and also all the others who served in different ways, and the civilians who suffered in the fighting and bombing. And we pray, like the Psalmist, for God to make “wars cease to the end of the earth” (9). Anyway, I was a little surprised at the choice but since then this psalm has gathered other associations for us. Most recently, it has become meaningful as we have been gazing up at the mountains above Altadena and exploring them on hikes, while remembering the very real threat of earthquakes here. Connecting with another Psalm (no. 121), we have been lifting “our eyes to the hills” and remembering that “our help comes from the Lord, who made heaven and earth.” In Psalm 46, the power of God is such that the city is held safe in the earthquake by the words, “Be still!” (10) – like Jesus’ disciples’ boat in the storm. And not only that, but militaries are forcibly disarmed and wars cease globally. God is ascendant over creation and the whole warring world. As I was looking at commentaries to prepare this devotion, I was interested to note a contrast between those written by Europeans and the Zondervan Africa Bible Commentary. The former, following Luther, focus on the threat posed by Israel’s human enemies and by warfare. They almost universally gloss over the natural disasters – earthquakes and tsunamis, which they tend to dismiss as with the words “cosmological” or “mythological” – as if they were merely poetic; whereas the African commentator gives the same weight to the forces of nature as to the forces of nations, to environmental disasters as to empires and other oppressors. In our current age, we are acutely aware that we need God’s mercy and deliverance from both types of evil and that many are suffering because of one or the other, or frequently both. When we walked up Eaton Canyon we discovered that there are rivers and even waterfalls in among the nearby mountains. And in the psalm too, we read of “streams” in the mountains that “make glad the city of God.” Although the psalmist is alarmed about the threat of the “roaring” and “foaming” sea waters (3), there is a form of water that is life-giving. In between the death-dealing forces of nature and the warring world, in verses 4 and 5 we get a glimpse of the life-giving city of God. And as frequently in the scriptures, the source of that life is water, a river. It is those streams, a sign of God’s presence, that make Zion a nurturing city, which not only shelters but also revives and strengthens (1, 4-5). Vandana, one of the Indian theologians I studied for my PhD, led an ashram, or religious community, overlooking the Ganges River in the mountains where it has its source. As she watched the Ganges, which is known as the mother and life of India, she found that throughout the Bible, water is a symbol of life. And not only that, water is also a symbol of the Holy Spirit, whom the Nicene Creed describes as the “life-giver.” She wrote a commentary on water in John’s Gospel and called her ashram “living waters,” a term that Jesus used to describe the Holy Spirit (John 7.37-39). In the World Council of Churches’ mission statement Together towards Life (2013), which is a mission theology of the Holy Spirit, we reflected how: “As a redeemed community we share with others the waters of life and look for the Spirit of unity to heal, reconcile, and renew the whole creation” (103). These references to water are the reason why this Psalm is associated traditionally with the liturgy for Epiphany when we think of salvation offered universally by Immanuel, of the baptism of the Lord, and of the sign of water into wine at Cana. Since we not quite out of Epiphany yet (Lent starts tomorrow! ), I would like to conclude with one of the Anglican collects, or collective prayers, set for that season that resonates with the psalm we have been reading. 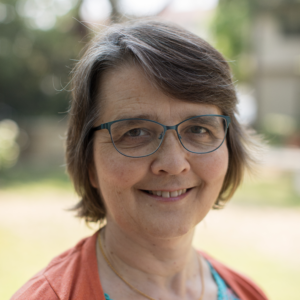 Kirsteen Kim, from England, joined Fuller SIS faculty last year as Professor of Theology and World Christianity along with her husband Sebastian Kim, who directs Fuller’s new Center for Korean Studies. She began her career as a theological educator in South Korea, was a missionary in India with the Presbyterian Church of Korea.